We’d love your help. Let us know what’s wrong with this preview of Finding Joy by Melanie D. Snitker. Nothing short of desperation would force Chelsea Blake to work on a local cattle ranch. Sometimes, what looks like a dead end, is really a new beginning. To ask other readers questions about Finding Joy, please sign up. 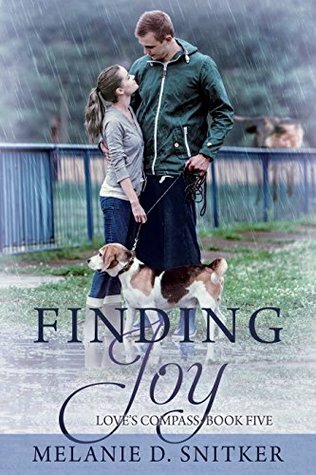 I enjoyed FINDING JOY, a sweet contemporary Christian romance. Melanie Snitker's work is a pleasurable read and the presentation immaculate (error-free). Her characters are likable and face real-life challenges and emotions I related to. Set in Texas, mostly on a wealthy cattle ranch, this story brings together two people who doubt themselves and their abilities. Their reasons are different, but inside, they're a matched pair. Parker and Chelsea are both badly damaged--one on the outside and one I enjoyed FINDING JOY, a sweet contemporary Christian romance. Melanie Snitker's work is a pleasurable read and the presentation immaculate (error-free). Her characters are likable and face real-life challenges and emotions I related to. Set in Texas, mostly on a wealthy cattle ranch, this story brings together two people who doubt themselves and their abilities. Their reasons are different, but inside, they're a matched pair. Parker and Chelsea are both badly damaged--one on the outside and one on the inside--so they're uniquely prepared to help each other heal, regain confidence, and become their better selves. I enjoyed the beagle, Happy, and his role in the story. I like deep books that make me think and inspire me. However, every once in a while it is nice to take a break and read something that is just light and fun. Finding Joy is one such book. I received a copy for review and curled up on a sick day to read. It was a good companion that left me feeling happy. The setting was one that I know well, as I live in central Texas and we actually have a longhorn farm not too far from us. The author, I am happy to say, knew her stuff and took some time to give the reader a little of an education, without making it obvious that was what she was doing. I received a copy of this book for review. I was not required to write a positive review. All the thoughts in this review are my own. Both Chelsea and Parker were lovable and believable characters. They each have their own issues and struggles that help the reader feel connected to them. However, none of those issues are weird or so heavy that they keep the book from being enjoyable. The romance was very sweet and not to overdone. Personally I thought there was one scene where Parker had his shirt off that wasn’t great, but the author didn’t go overboard, so it wasn’t an issue. The kisses were not drawn out to the point I was rolling my eyes or felt embarrassed. They were sweet, and then the characters moved on. The faith aspect was there. It was not a major part of the story, nor do I think the story would have been the same without it. It felt as if it was just part of the normal rhythm of life, which is a good thing. Overall, I thought the book was nice. I look forward to picking up more books by this author. I was very excited to get this book when it came out and read it quickly. But I was somewhat disappointed. Don't get me wrong, I loved the characters! And the whole message of moving on past the hurts and pain was good, though there didn't seem to be as much focus on God's help and guidance as there probably could have been. I really enjoyed getting to "visit" characters from the earlier books in this series. My objections were that the story seemed to be almost completely focused on the romance I was very excited to get this book when it came out and read it quickly. But I was somewhat disappointed. Don't get me wrong, I loved the characters! And the whole message of moving on past the hurts and pain was good, though there didn't seem to be as much focus on God's help and guidance as there probably could have been. I really enjoyed getting to "visit" characters from the earlier books in this series. My objections were that the story seemed to be almost completely focused on the romance between Parker and Chelsea and how they couldn't stop thinking of each other, and how they smelled, how their hearts pounded or skipped, and the electricity that went through them at the slight accidental touch of the other. I got rather tired of it all. I had been hoping this book would be more like the first three in the series where there was another storyline to focus on and the "romance" seemed secondary almost accidental. This also seemed short. I finished the book and felt like I was missing something. I have no idea how long the other books are, so it was probably just me, but I wanted something else. This was an awesome book on bitterness and how it can take over your life. I was greatly pleased to see the main characters turn to God and ask for help. Bitterness had created a gap in his personal relationship with Christ and with his relationship with his family and friends. Once I started this book I finished it in less than 24 hours. It was hard to put down and loved reading the adventure of Parker and Chelsea. Together they overcome many obstacles and were good to even each other out. I rec This was an awesome book on bitterness and how it can take over your life. I was greatly pleased to see the main characters turn to God and ask for help. Bitterness had created a gap in his personal relationship with Christ and with his relationship with his family and friends. I recommend this to all Christian Romance Fiction readers. But just a warning - You need to start with book 1 and read all 5 books! It will not be a waste of your time to build the story. I read the first 2 books in this series and really enjoyed them so when offered the chance to get an advanced copy (ARC), I jumped on it. I really enjoyed reading about both Parker and Chelsea. I kept trying to find moments to be able to get back to reading their story. "Finding Joy" was an appropriate name for this book. I would love to see Melanie Snitker continue with this series. I am definitely going to go back and read the 3rd and 4th books in this series to see what I missed. Wow! I started reading this book and couldn't put it down! Parker and Chelsea have a great chemistry, clashing at first and coming together in a sweet romance. I loved the way Snitker developed the characters, gradually revealing the past that had scarred them inside and out. It was beautiful to watch them grow and learn to trust and love. All around great book! I highly recommend this one to anyone who loves Christian romance or sweet romance. I was given an ARC copy to read, but it didn't affec Wow! I started reading this book and couldn't put it down! Parker and Chelsea have a great chemistry, clashing at first and coming together in a sweet romance. I loved the way Snitker developed the characters, gradually revealing the past that had scarred them inside and out. It was beautiful to watch them grow and learn to trust and love. All around great book! I highly recommend this one to anyone who loves Christian romance or sweet romance. A beautiful, satisfying addition to the Love’s Compass Series. While including characters from the other books in the series, this story focuses on Parker and Chelsea. Grumpy, brooding Parker Wilson has had a year to recover from the devastating car wreck that nearly destroyed his life. “The chip on his shoulder is bigger than the scars on his face or the scars on his heart.” Haunted by nightmares, Parker has lost his girlfriend, his sponsors, his father, and his dreams for the future. “Losing A beautiful, satisfying addition to the Love’s Compass Series. While including characters from the other books in the series, this story focuses on Parker and Chelsea. Grumpy, brooding Parker Wilson has had a year to recover from the devastating car wreck that nearly destroyed his life. “The chip on his shoulder is bigger than the scars on his face or the scars on his heart.” Haunted by nightmares, Parker has lost his girlfriend, his sponsors, his father, and his dreams for the future. “Losing the endorsement had been hard enough. But the damage to his arm had put an end to his rodeo career as well.” He has begrudgingly returned to his family’s ranch, back home to his mom and sister, and back to a million memories of better, happier times. Her parents had a fit when she left their plans for her behind and followed her sister to Kitner, Texas. Courageous and spunky, Chelsea Blake finds that trying to prove her worth seems an impossible task. “He’s got issues. I have enough of my own to sink a small ship.” Both Parker and Chelsea are plagued by “doubt and self-consciousness.” Chelsea’s strength and confidence grows as she makes a place for herself at Wilson Ranch. This story goes from haunted and contemplative to fun and flirty as the relationship between Chelsea and Parker intensifies. I was immediately immersed into the daily routines of a working cattle ranch. I was drawn to the focus on faith in God, learning to trust again, praying for miracles, and the gift of daily blessings. “It takes real courage to break away…and blaze a new trail.” This clean story is appropriate for ages 12+. I cannot wait to read the next book in this addictive series. What a lovely novel!! I really enjoyed this sweet romance by Melanie Snitker. I especially fell in love with the main characters Parker and Chelsea! They are so adorable together and I was rooting for them from their first messy encounter. I loved how Chelsea and Parker grew as a person and learnt to be confident of themselves. I loved how the plot unfolded and I really enjoyed all the ranch aspects. I also really liked some of the secondary characters, especially Laurie and Kara. I really want What a lovely novel!! I really enjoyed this sweet romance by Melanie Snitker. I especially fell in love with the main characters Parker and Chelsea! They are so adorable together and I was rooting for them from their first messy encounter. I loved how Chelsea and Parker grew as a person and learnt to be confident of themselves. I loved how the plot unfolded and I really enjoyed all the ranch aspects. I also really liked some of the secondary characters, especially Laurie and Kara. I really want to meet Nicholas!! Overall, I really enjoyed this sweet romance and I would recommend it! Another wonderful book, though I 'm sorry it is the last of the series. This story is about Chelsea and Parker. Chelsea has rejected her rich parents' future for her and is making an identity of her own. She begins work on a cattle farm and immediately butts heads with Parker, her boss. However, time has a way of changing things. Many of the same characters are still in this book, but their stories expand. The series, as a whole, was well written with good strong characters and plot. It is a real Another wonderful book, though I 'm sorry it is the last of the series. This book was a joy to read. A refreshing book filled with life's struggles. Relationships, parents controlling, sisters helping and encouraging each other and strong bonds formed. Work environment and a willingness to take on the unknown as a challenge. The characters of Parker and Chelsea were so nicely developed from employees to friends then to a relationship. Challenges of stepping out into the unknown and being independent. I thoroughly enjoyed this standalone book. Loved the unfolding story of facing challenges life gives us - even the families we are born into. Each of us has faced insecurities and have risen above them or been heart broken. Each of us are unique and come to face fears, insecurities and doubts. Chelsea,Tucker and their families reach out and reveal love & joy. It's 5:00am and I'm just finishing the book. It's that great! Melanie Snitker wove an amazing story of blossoming love between two people who have an electric attraction to each other, yet hold out for God's way in his timing. I'm thankful for Christian writers who can weave stories superbly for readers like me. What a beautiful story of Chelsea and Parker as they found each other. Farmer's terrible car accident left him scarred and broken. Chelsea's parents didn't trust her to make life decisions. Once they met, everything fell into place as they complete each other's lives. Sweet! wealthy parents all her life but still falls short has decided to quit trying to please them. She has taken a job on a ranch much to her parents displeasure. She loves her job and the independence she has. Her job starts out a little rocky with her employer but you can read the book to see how it develops. This story is about finding joy after surviving a horrific accident. I found inspiration and determination is one small woman. What Parker puts her through to get her to quit was quite entertaining. This romantic story allows us insight in how love finds us when we try to push it away. Chelsea and Parker were both floundering without being happy. She didn't know what she was. He was bearing physical and emotional scars from an accident. Plus he was her boss. A relationship was not possible. Snitker's book is charming. I loved this story. I loved the relationship between the sisters and feel their connection was made stronger in spite of their parents. The main characters had a wonderful connection. This was a great, clean romance. This book received a five star from me because it held my interest. The characters were well written. I think the parents were a little "off", only because they just didn't fit, but otherwise, I enjoyed the story line. Thank you. It took me less than 24 hours to read and I have such a hopeful outlook that God is always in my life. Hope is calming. Looking forward to other books by the author who definitely has a grasp of God's love and compassion. Jesus Saves. I haven’t enjoyed a book in this genre so much as this one. It’s good. There is good back story and the main characters are mature. It’s well written and makes a good change from the lite reads I’ve read before. It’s real nice. Finding joy is a perfect title for a great book. It is an uplifting feel good book! Loved how both of our main characters had insecurities and how they helped each h other to feel good about each h other. I loved this clean romance about 2 hurting people finding each other despite life's challenges. It was heartwarming and a beautiful story. A stand alone book, but I can't wait to read the other books in this series. I highly recommend it! This author and genre are new to me, and what a lovely surprise. The characters immediately drew me in and the story kept me reading, when I should have been working. A wonderful read. Melanie D. Snitker has enjoyed writing fiction for as long as she can remember. She started out writing episodes of cartoon shows that she wanted to see as a child and her love of writing grew from there. She and her husband live in Texas with their two children, who keep their lives full of adventure, and two dogs, who add a dash of mischief to the family dynamics. In her spare time, Melanie enjoys Melanie D. Snitker has enjoyed writing fiction for as long as she can remember. She started out writing episodes of cartoon shows that she wanted to see as a child and her love of writing grew from there.